On November 22, 1922, Howard Carter opened King Tutankhamen's tomb -- and triggering various crazes. 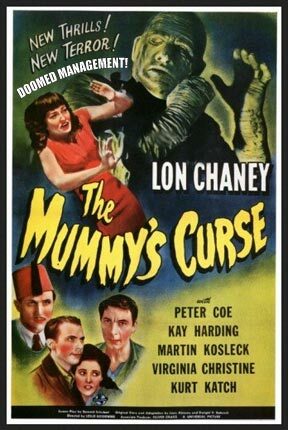 For me, the most entertaining was THE MUMMY'S CURSE!!! Various pundits and assorted strays have suggested that Carter unleashed SUPERNATURAL FORCES thereby. In my (jaundiced) view, something similar happened when academics entered the realm of BUSINESS MANAGEMENT. Unnatural (if not supernatural) forces were released thereby. Most obvious is the absurd spectacle of practicing managers being taught by people who may have never practiced management. Don't want to be misunderstood. People go to business school with the best of intentions - to become better managers, to get a better job and so on. But we often pick up more than we bargained for. And to be fair, management schools have produced great senseis - Michael Porter, Russell Takeoff, Henry Mintzberg and others come to mind. But great senseis such as these are noteworthy for being up front about what they don't know. Takeoff, Mintzberg, the Hopper brothers, and others have written about what I'm calling THE MUMMY'S CURSE. Mintzberg has suggested, half-seriously, that MBA graduates should have a skull & crossbones tattoo on their foreheads. The Hopper brothers argue, in all seriousness, that America's competitiveness varies inversely with the number or MBAs and lawyers graduating. I'm having a bit of fun, of course. But if you're going to business school, or have just graduated, be alert to the risks. Remember Howard Carter and THE MUMMY'S CURSE!!! Very funny! By the way, I think I found a typo. Don't you mean Ackoff? (Seriously)...you're quite right -- I meant Russell Ackoff! Glad you enjoyed the (eccentric) post.